Many mental health issues are rooted in the burnout cycle and the ever-present desire to achieve. The commodification of self-care proposes a quick and easy fix to these problems even though they aren’t easily fixable. The actual definition of “self-care” has changed throughout the centuries, but the contested relationship between the individual and the political climate remains at the root of many attempts to de-stress. As French philosopher Michel Foucault argues for the Greeks and Romans, “care of the self” was the introspective practice of working on the mind and soul: focusing inwards instead of outwards. This often entailed temporarily leaving politics behind for the purpose of becoming more self-aware, then eventually returning to the political sphere as a better citizen. Centuries later, taking a breather from the stress of politics is considered a way to justify and legitimize the practice of self-care. Such individualism is demonstrated in an often-cited quote by the activist and writer Audre Lorde: “Caring for myself is not an act of self-indulgence; it is self-preservation, and that is an act of political warfare.” The context of Lorde’s quote lies in the heavy intersections of race, womanhood, and activism; her practice of self-care was radical because she was a black woman putting herself first in a world attempting to make her pain invisible. However, Lorde’s quote has been commercialized to the point of mainstream acceptance. Context typically thrown aside, her words are frequently emblazoned across T-shirts and featured in wellness articles preaching step-by-step guides to improved mental health. It seems that the radical notion behind her self-care has been diluted to encompass something different altogether. Today, self-care is a buzzword. Often synonymous with the phrase “treat yo self,” it’s colloquially thrown around as justification for acts of self-sabotage or self-indulgence, such as eating 3 pints of ice cream in one sitting. There’s a difference between taking care of yourself and pampering yourself, but because self-care is advertised as a self-indulgence we’re all entitled to, our indulgences have become normalized as genuine catharsis. Other times, we buy into the $11 billion wellness industry’s definition of self-care, following rituals and cleanses that promise to make us better, partially because if we don’t, we’re depriving ourselves of what we deserve and holding ourselves back from reaching our fullest potential. Self-care is no longer a way to take a temporary breather from a stressful world — it’s a lifestyle, the endgame itself. It’s a trendy choice we think we should make, and so we buy expensive face masks, make green juices, and namaste our way to happiness. Yoga, with all of its proven mental and physical benefits, has its place, but capitalism has another. The commodification of self-care is problematic because it rests upon the belief that the input of a certain amount of money will guarantee a certain output, one that will hopefully help you snap out of mental illness and suddenly find increased pleasure in being alive. This one-size-fits-all, buy-your-way-to-happiness approach overlooks the context-sensitive intricacies of mental health in favor of a quick and easy fix for something that isn’t easily fixable. Pettitt says that her personal definition of self-care has since evolved to prioritize “maintaining the best state of mind possible.” For her, this entails mind-mapping her thoughts, practicing mindfulness, meditating, and adhering to a personal schedule. She also believes that the practice of self-care looks different for each individual because different people have different methods of coping with their unique problems and stressors. Some people may find genuine catharsis in face masks or bubble baths; others may find it through their friends or family, or even in other places like sports or music. Self-care is ultimately not a one-size-fits-all solution — it reflects how you view and affirm yourself, which is far more personal than the self-care marketed to us ever could be. College students especially face substantial mental health issues. Universities across the country are becoming increasingly competitive, and students struggle to balance academics, social life, personal health, and other disciplines on top of the uncertain chaos of navigating young-adulthood. Yet mental health has become less stigmatized than in years past, and people are more willing to seek help and change the conversation around mental health. Culturally, there is a declining stigma and more acceptance toward people struggling with mental health. 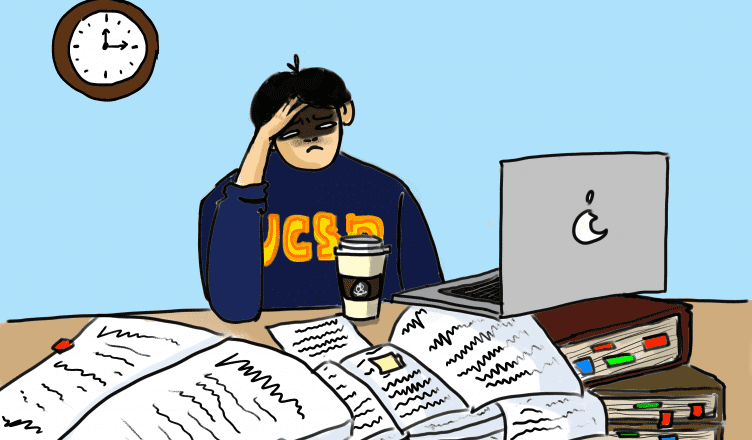 At UC San Diego, however, many student mental health issues tend to arise due to the competitive academic environment and reclusive social atmosphere. As a result, it is not common for students to overwork themselves to the breaking point, but then keep going. The fast-paced nature of the quarter system perpetuates this stress and contributes to the burnout cycle. “Burnout,” according to an in-depth article on the topic by Buzzfeed, “means reaching [the point of exhaustion] and pushing yourself to keep going, whether for days or weeks or years.” It’s a never-ending cycle perpetuated by the desire to optimize yourself and your circumstances — your capital — for maximum efficiency. No relief comes with the completion of a task because there’s always something else to do, another level of achievement to aim toward. Work — overwork in particular — is celebrated; busyness and stress are lauded as measures of success. Time spent relaxing could be time spent studying. You could be getting a day ahead on your homework, or applying for internships. There’s always some better way of being more productive. Theoretically, the more capital you invest, whether it be time or energy, the greater your return will be. But the crux of college burnout lies in the following paradox: the investment of time, work, and energy supposed to deliver the return of greater socioeconomic security, along with the accompanying happiness it is promised to bring, is actually making us more unhappy. We work and work, often without even the knowledge of what we’re striving toward, even as the burnout cycle threatens to break us. We optimize our capital and then collapse into anxiety, turning to the commodified practice of self-care in hopes that it will magically cancel out the damage of the overwork we impose upon ourselves. Pettitt is right: If we don’t make the choice to stop for a moment and breathe, we’ll optimize our way through life without even living it. Students seeking services for mental health can contact Counseling and Psychological Services (CAPS) by calling (858) 534-3755. Their website also provides resources for self-help and other needs. You mean, of course, that we are overcoming people who proffer that prejudice. We are becoming wiser.